First, we just put up a new build of sdsql. Go get it or the last thing here will not work. SQL is a great and verbose language so there's many ways to shorten what we have to type. 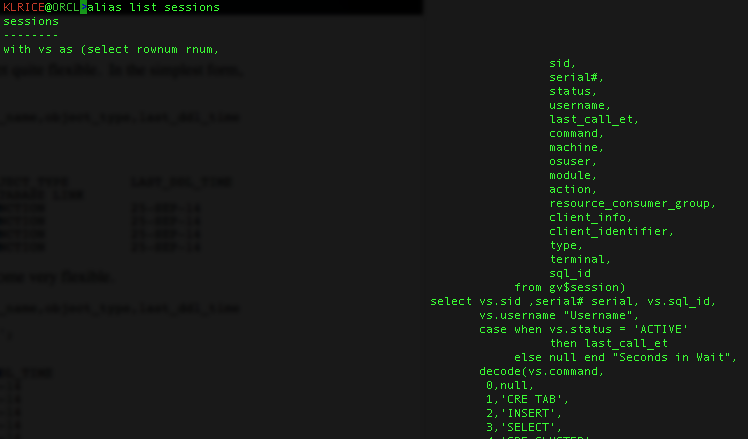 As simple as a view or saving a script to call later with @/path/to/sessions.sql SDSQL is taking it a step further and we added aliases to the tool. Almost as if right on queue, John asked if we could add them. 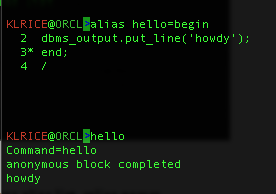 It works for aliasing off plsql calls also. If you need to see the aliases defined, just type alias or alias list. There's lot you can do with this to save lots of typing and personally there'll be lots less typo for my presentations! Lastly, for the one that went and downloaded the build we just posted today there is a new CTAS <TABLE> <NEW_TABLE> command added just yesterday. The idea here is yet again to save on typing. This is just getting dbms_metadata information so what is used can be adjusted as I explained here Then strip off the things not needed ( i.e. datatypes ) swap out the names and you get a new table with very very little typing. Note the index on empno carries over.